Trouble Washing, Showering or Flushing? No Problem! Flow Plumbing can have your drains cleared and flowing like new today! When it comes to slow draining showers or tubs, clogged or backed up toilets and sinks, or low flowing faucets or shower heads; We’re the go to plumber to get them flowing right with our fast & affordable drain cleaning service in Plano Tx. We’d like to say that no two plumbing problems are exactly alike but that just wouldn’t be true when it comes to clogged drains. Here at Flow Plumbing & drain cleaning in Plano, we’ve cleared thousands of clogged sinks, sewer lines, toilets, bathtubs, and shower drains. It is our experience in handling so many clogs that makes us experts in the quick diagnoses and removal of plumbing clogs. When we arrive at your home we will examine the clogged item and give you a quote on the repair cost. You will know exactly what it’s going to take to get the drain cleaned and we will do our very best to give you an accurate and honest estimation of the time it will take. Rest assured, when you Go With the Flow, you’ll never pay more than you’re quoted for any plumbing work. The price is the price no matter how long it takes. This is our commitment to honest plumbing service to our customers in Plano. If your toilet has started overflowing and looks like it is going to start, the first thing you can do to prevent water overflow is remove the top of the toilet’s water tank and close the flapper. The flapper is the round plastic and rubber part that allows water to be released from the tank into the bowl. Even the most stubborn toilet clogs can be cleared with the right plunger and some elbow grease. Stick the plunger into the bowl and make sure that a seal is formed over the hole. If air or water is allowed to make way between the plunger and the hole, the suction power will be greatly impacted and highly ineffective at clearing the blockage. Contrary to popular belief both the push and pull of plunging are highly important. Give it a few solid strokes and give the toilet a test flush. If the water clears from the toilet bowl, great! You’ve successfully cleared your clogged toilet and saved yourself from having to schedule an appointment. If the toilet starts overflowing again, manually close the flapper to stop water from running into the bowl. You can try this a few times but if it doesn’t work after a few minutes of effort your problem may be too much for a plunger to handle. When to call a plumber. There will no doubt be times when your best effort simply isn’t enough to remove a tough toilet clog. When water begins to back up into sinks or showers whenever you flush a toilet in your home, it’s time to bring in a professional plumber. The backing up of water into sinks, showers, and drains means that your homes main line is suffering from a clog. A plunger or even an auger will not be enough to clear the lines and get the job done. If you are suffering from a clogged or backed up toilet or suspect it may be the main line, give Flow Plumbing a call at 214-388-8838 and schedule our Plano Drain Cleaning Service Today! We can clear even the toughest clogs both quickly & affordably! 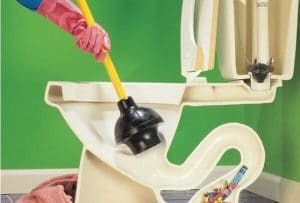 When it comes to clearing a clogged sink there is one piece of advice we can give you to get the job done by yourself. But first, a warning. Do not use harmful OTC products like Drain-O or Liquid Plmr in your home! These products work by expanding in your homes pipes to push clogs through the lines. They are typically effective but can create $1000’s of dollars in costly repairs to your homes sewer lines. Instead try this safe mixture of common household ingredients to clear dirt, hair, soap scum, and toothpaste buildup from clogged rains. 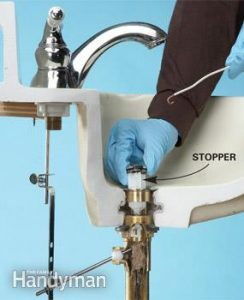 Remove the stopper in the clogged sink. Bring a full kettle or large pot of water to boil and pour it into the drain. Next you’ll add one cup of baking soda powder directly into the drain followed by 2 cups of white vinegar. Use a wash cloth by pressing it firmly into the top of the drain to make sure the reaction happens down the drain line and not back up into the sink. Wait 20 minutes and pour another pot or kettle of boiling water into the drain. If the water won’t go down the drain you can try using a plunger to push it down. When to call a plumber. If you’ve followed the steps above and your clogged drain is not clean and running smoothly, it is time to call a plumber to perform clogged drain cleaning Plano. Here at Flow Plumbing and clogged drain cleaning in Plano we have a wide variety of tools and equipment at our disposal to aid us in clearing even the most backed up plumbing systems. What’s more, we have decades of experience serving the residents of Plano Texas. We can show up fast and diagnose and repair the problem quickly. Ultimately providing you with top quality plumbing service all the while saving you both time and money. Need Clogged Drain Cleaning Service in Plano Texas?